Railpictures.ca - A.W.Mooney Photo: So I am out there hoping for a decent shot of the Steel Train out of Hamilton, or perhaps the afternoon Laser train. It happens I get both, on the move, almost right in front of me. Some days are like that. At least one didn’t cancel out the other, which can be maddening. I’m on the hillside on the NW side of the 403; and here, running east, is the Laser, with GT 6414 and 6417 whilst in the foreground is the Steel train destined for Nanticoke, with CN 4572, 9196 and 4533. | Railpictures.ca – Canadian Railway Photography – photographie ferroviaire Canadienne. Caption: So I am out there hoping for a decent shot of the Steel Train out of Hamilton, or perhaps the afternoon Laser train. It happens I get both, on the move, almost right in front of me. Some days are like that. At least one didn't cancel out the other, which can be maddening. I'm on the hillside on the NW side of the 403; and here, running east, is the Laser, with GT 6414 and 6417 whilst in the foreground is the Steel train destined for Nanticoke, with CN 4572, 9196 and 4533. 239-238 were the Chicago- Toronto Laser’s. 233-234, 235 -236 were the Toronto – Montreal versions. Crews joked that they were great to work as you never got a Clear to Stop signal, but had to “Laz” around for hours to get them. 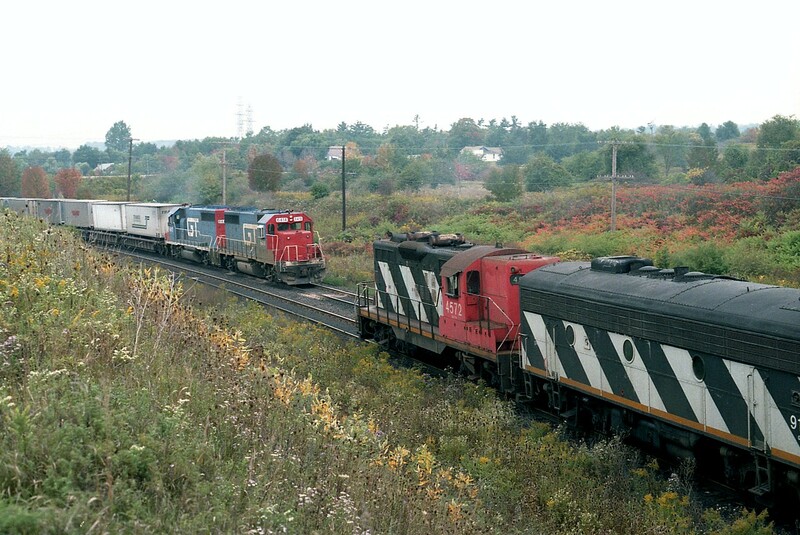 Brad: Mike Lockwood described the “Laser” back in commentary of photo #12629 about 5 years ago stating the “Laser was a Chicago-Montreal trailer train that utilized ‘well cars’ for moving (truck) trailers thru the St. Clair Tunnel”. This being before the tunnel was enlarged and the service redundant. The GP9 upset a lot of us, as the classic A-B-A combo had brought us out in groves. Stuart: I’m not sure on the steel train routing; it began thru Hambone and shared with CP (TH&B) over 9 week or three month intervals, something like that. I think they only used the Hambone downtown route in the spring of 1986 and after that went by way of Dundas Sub. Very nice again Mr Mooney! Sorry..but what was a ‘Laser’ train? Love the double GT units and the use of a GP9m on what I understand was normally F9′s and a B-unit. So these were the trains of the time I was an infant! Nice Arnold…another classic shot. I definitely remember those Laser trains…the one you captured here was quite similar to what I recall seeing in Kitchener on the Guelph Sub. As they say, sometimes it’s better to be lucky, than be good! When did the steel train run from the lower city to Nanticoke switch from the former H&NW routing via Ferguson Avenue to the path via Brantford?